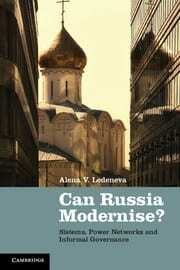 In her 2013 book Can Russia Modernise? Alena Ledeneva picked out key types of networks that make up Sistema: Russia’s complex, ambiguous and sometimes surprisingly effective system of informal governance. In the final part of a three-part ‘mini-symposium’ the author reflects on and responds to critical assessments of the book. The criticisms made by Katharina Bluhm and by Geoffrey Hosking are both valid and valuable. In my response I will attempt to clarify my arguments, where I can, and call for further research, where I cannot. How do we define sistema? Sistema stands for the network-based informal governance system backing up the formal facades of power. I agree with my critics’ point that sistema is a runaway target. My method was to rely on respondents’ perceptions of it. But they often varied a lot, as in the fable about the elephant and the seven blind men. There are a range of definitions in the glossary of the book. I pieced together a detailed ethnography of sistema, but conceptualising sistema proved elusive. Imagine that you had to share a room with an aggressive madman all your life. Moreover, you also had to play chess with him. One the one hand, you had to play so that you would not win and anger him with your victory; on the other, you had to play so subtly that he would not suspect that you allowed him to beat you. When the ‘madman’ disappears this precious skill and the life-long experience of survival with a madman turns out to be redundant. Sistema reveals its features mostly to those who feel pressurised or victimised by it, rather than to its beneficiaries (President Putin is one of latter at the moment, but his memoirs will be an invaluable source on sistema one day, just as President Gorbachev’s ones are now).